The physician workforce shortage creates a competitive recruitment marketplace. 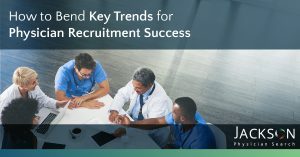 This white paper offers practical advice on what to do today to focus your recruitment strategy for long-term success. There’s been heavy discourse the last few years about the growing physician shortage in the United States. Based on a recent detailed study, the Association of American Medical Colleges (AAMC) now projects a shortage of between 40,800 and 104,900 physicians by 2030. A complex set of assumptions factor into the models resulting in projected shortage that vary in degrees of magnitude depending on the location, specialty and population served. The Affordable Care Act has helped push the percentage of insured Americans to nearly 90 percent, creating a greater need for primary care physicians to see new patients. At the same time, uncertainty around healthcare legislation and the sheer complexity of reimbursement is enough to steer many physicians – both aspiring young doctors and those with years of experience – away from patient care. Our population is shifting older; the Census Bureau project that the population 65 years and older will become larger than the population under 18 years old by 2056. And while America ages, so do its doctors. Nearly 30 percent of active physicians are now over the age of 60. Jackson Physician Search compared open jobs by specialties from ten top job boards and compared them to the number of third-year residents for those specialties, as provided by MMS data. Assumptions that played into our research model: The turnover rate for doctors hovers around 6.8 percent, according to the American Medical Group Association. We recognize that retirees – and practicing physicians who change jobs – both leave vacancies that will most likely be filled fro the pool of graduating residents. Some are advertised on multiple job boards, while others are not advertised at all. Based on this analysis, the specialties with the greatest demand are: family medicine, internal medicine, and psychiatry. Young medical students are forgoing these for more technical specialties that result in more defined hours, high mobility, higher incomes, and the perception of greater prestige than primary care. The stigma of mental health may be a factor in turning medical students away from psychiatry, in which only half of residency programs in the U.S. are filled, according to Dr. Adam Brenner, a psychiatrist and associate professor at UT Southwestern Medical Center. Not only are there not enough doctors to go around, they aren’t evenly distributed. The resulting barriers to accessing specialty care creates significant – even tragic – disparities in health and well-being among many rural Americans. Nationally, there are, on average, 91.1 active primary care physicians per 100,000 people, but some states fared better than others, according to the AAMC, which based their distribution map on census and American Medical Group data. Read the full whitepaper by clicking the download button.